As a woman, stepping on the scale creates two emotions; fear and hope. But when the scale does not explain the sudden 5 pound weight gain even though you ran all week, at 30% when you feel your thinnest ever, it can leave you with confusion and low self-esteem. Hologic understands this frustration and that is why they created a whole-body scan, that gives a detailed breakdown of body fat and lean muscle mass distribution throughout your body. Body Mass Index (also known as BMI) uses height and weight in its formulary to calculate body measurements per region. It lets one know total body mass, regional body mass, lean versus fat muscle mass and visceral fat percentages. Researchers of the North American Menopause Society discovered that 18.5% of women who were considered to have a normal BMI had significant excess fat, making them “skinny fat” while some women with overweight BMI’s had normal levels of body fat. Once the scan is finalized, a completed report that details the regions measured. This information is helpful to determine if you are at a higher risk of developing many common disease processes, like diabetes and cardiovascular disease for example. Your overall body-fat percentage is revealed and can be compared with reference values with other Americans. The Body Composition scan is extremely accurate in measuring your specific areas. It is also quick, painless, and most of all safe, especially compared to a qCT scan which emits three times more radiation. The scan is extremely accurate it is also quick, painless, and most of all safe! 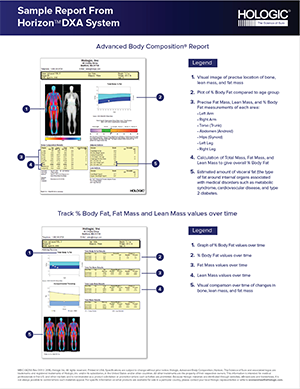 To find out more body composition for human performance click here. To find out more body composition for weight loss click here.